I didn’t want the week to end without showing you what I did with the rest of my blueberry syrup. You may want to make a nice breakfast over the weekend after all and I want to make sure you have not one, but two suggestions from me 🙂 One rich and decadent, the other lighter, though certainly no less decadent (or less pretty). It’s no secret that I love yogurt, and that I am always on the prowl for the thick creamy variety I used to have in Greece. I was over the moon when found this one. I was even more thrilled to find a local dairy farm** that makes their own Greek-style yogurt! And did I mention that mangoes are in season? No recipe here. Just go to your farmers market. Find some fruit in season – one to make into jam or syrup, one that begs to be eaten fresh. Chat with the purveyors. Get the best yogurt you can find. If you live in Greece say a prayer of thanks to the yogurt deities. Make your own granola (it’s easy!). Pat yourself on the back. 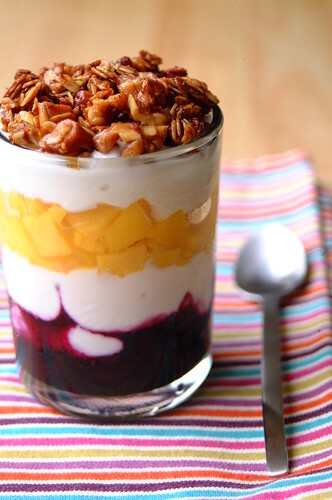 Showcase all this in the way they deserve – so that each brilliant layer can be admired (syrup/jam, then yogurt, then fresh fruit, then yogurt, then granola). Sit somewhere where you can see a little sunshine (I live in a little 3rd floor flat in a cramped city, no garden, no balcony, so no excuses…even the tiniest ray will do!). Dunk your spoon in all the way down. Enjoy. Really, I mean it. Stop thinking about what you are going to wear tomorrow or if you have time to gas up the car. Enjooooy. **Rizal Dairy Farms makes Greek style yogurt. It’s thick and creamy and delicious! You can find them at the Saturday Salcedo Market in Makati, or at the fresh produce open air section at Market! Market! Taguig.